We had a FULL week this week. The boys stayed busy with Camp Invention during the day and baseball most nights. 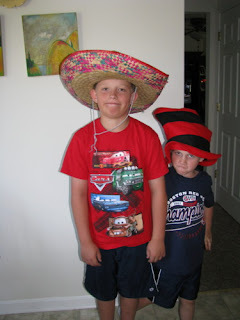 For Camp Invention, they enjoyed Crazy Hat Day. 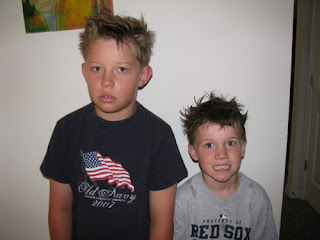 For Bad Hair Day, Blake was pretty much "come as you are" after rolling out of bed. I did spray it to get it to stay. Kevin's hair is a little more well behaved, so his took some work (and teasing!). Although you can't tell from Blake's face (he was still asleep, I think! ), they both really liked it. Unfortunately, Blake's baseball team is finished for the season now. They were knocked out of the double elimination tournament on Wednesday night. 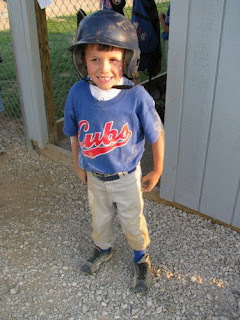 Blake is now finished with baseball until the fall league starts up in August. We are still proud of him. 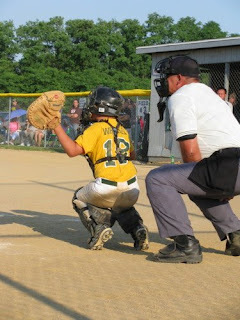 He picked up a new position this year - catcher - and did a really good job. Thursday may have been our favorite day for Camp Invention. It was Mismatched Outfit Day. The boys loved mixing up their clothes. Both chose camo shorts and knee socks. Blake's socks were his old baseball socks and he pulled out a blue and pink striped shirt to top off his look. 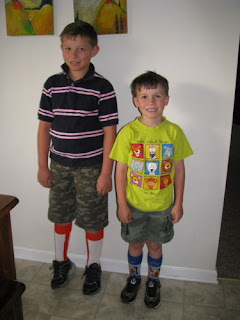 Kevin wore the craziest Tigger knee socks and a crazy lime green tee with animals all over the front. After picking them up, we stopped by a store and I didn't even think about how they looked until we were already inside. I must have looked like mother of the year with these two dragging behind me! After having one loss in the Rookie league tournament, Kevin's team came back to win back to back games on Thursday night. Kevin had some great hits and even made a slide going into 2nd base. (Check out all the dirt in the photo below!!!) His team is now in the championship game Monday night. To win, they'll have to beat the Mets twice (since it's double elimination and the Mets have no losses in the tournament). Go Cubs!! !